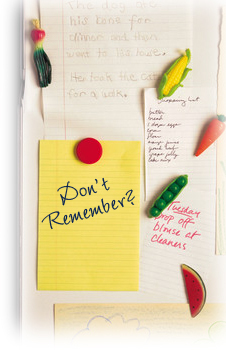 Forgetfulness and Aging - Just the Facts of Life? Where did you leave those eyeglasses? You know you can't read a word without them! And the keys . . . they were right here yesterday, weren't they? When you got back from . . . where was it you went yesterday? Getting older and getting forgetful are facts of life, right? Though aging is considered the major cause of long-term memory loss, stress is the primary reason for shorter-term memory problems at any age. Prolonged periods of stress can significantly impair the ability to concentrate, and that makes it hard to recall important information: just ask any student at exam time. The two major manifestations of prolonged stress are depression and anxiety. The low self-esteem and negative expectations they cause can ruin memory performance. If you expect to forget, you will. Face it: aging can be stressful, as well as depressing. That's a double whammy! Have you developed a sweet tooth lately? 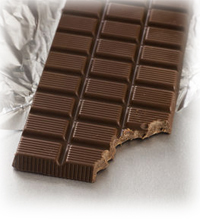 Is that craving for chocolate getting stronger? Under stress, the brain's ability to process glucose is restricted. Glucose is the only source of energy the brain the brain can use, so you may find yourself eating more candy, just to catch up. There's more. If we cut it too much slack, the brain slows down. Such slow-brain activity can prevent the engagement of the frontal lobes--the part of the brain where working memory and attention originate. Doctor tell you to just get used to it? That would be a big mistake. In more than 12 years of clinical work with people who had memory or concentration problems due to injury, disease, aging, side effects of medication, abuse of drugs or alcohol, stress, anxiety, and depression, in every single instance, improvement has been significant. The brain is much like a muscle. If you don't train it regularly, it loses its tone. SharperMemory is a very powerful training program that not only exercises the brain, but also works specifically with all aspects of memory: short-term, working, and long-term memory in general, and--more specifically--remembering numbers, names, words, objects, concepts, appointments, to-do lists, shapes, and colors. Memory impairment is NOT irreversible. But there's a difference between improving memory and repairing it. Memory improvement involves the use of tricks and techniques to compensate for memory deficiencies, for example, a personal digital assistant (PDA) or palm pilot, sticky notes, to-do lists, acronyms, rhymes, and visualizations. Memory repair, in contrast, helps you to correct the underlying problem, so that you can reduce, or even eliminate, the need for props and gadgets. Be honest: Have you ever been busy with a task, hurried to another room for something you needed, and stopped short to wonder, "Now what was I trying to find?" Remembering what you want to do in the future is called "prospective memory." Even remembering to look at your to-do list requires prospective memory. The good news is, your memory can be repaired. Aging does not have to mean forgetting. SharperMemoryand SharperBrainboth work with the fundamental structures that enable strong memory and clear thinking. Read more about the way these powerful programs work, and consider how much better life can be--when you can find the car keys! Don't feel like you have to just "cope" with memory loss and concentration problems - take back your memory by training with SharperMemory! Just 20 minutes a day, 3-4 times a week can help you make a remarkable improvement! Click Here to Order SharperMemory Now!